On the western fringes of Belconnen, a new development project, Ginninderry, is taking shape. The development will see more than 5000 houses built within the ACT and (ultimately) a similar number across the border in NSW. While the developers have consulted extensively with residents of the adjoining Belconnen suburbs, few Canberrans will be familiar with Ginninderry. This is unfortunate, because the project is huge – 30,000 people (roughly the population of present-day Weston Creek) will one day be living in this far-flung part of the city. Ginninderry is also problematic. Indeed, it seems to fly in the face of much that (you would think) a Labor-Greens government stands for: the creation of a more compact city, one whose design exhibits a strong environmental consciousness. For not only will Ginninderry take Canberra’s sprawl to the ACT’s borders and beyond, it also impinges on natural landscapes of great beauty and significance. The ACT government has committed itself to the development through its participation, via the Land Development Agency, in a joint venture with Riverview, a private developer representing the interests of landholders in the area. Although the developers have committed to conserving the outstanding natural features of the area, which include Ginninderra Falls, there should be no doubt that the houses of Ginninderry will compromise any chance of reserving a truly unique part of Australia for future generations. As is so often the case, concerned local citizens have been fighting for years to push governments into properly conserving Ginninderra Falls and the area around them. But the developers have made their case strongly and persistently, and the government has hastened to make the necessary changes. Large tracts of ACT land formerly designated as rural or buffer zones were rezoned to urban last year. On the NSW side, Yass Valley Council will soon consider rezoning land currently set aside for environmental protection and management, to allow for urban development. If the council takes this step, it will be a large and risky move for Yass Valley. This is because a cross-border development raises many issues, such as who pays what for services and infrastructure, that will be difficult to sort out. So far, there has been some discussion of these issues between the ACT and NSW governments, but Yass Valley Council has yet to be involved. Let us hope that, in the interests of the environment, if not those of their own ratepayers, the council calls a moratorium on the rezoning. Councillors may well wonder why they have been put in this difficult position in the first place. For without the active involvement of the ACT government, this truly problematic development could not have proceeded this far. The interests of the landholders in the area are easy to understand. Rezoning delivers them significant profits. The ACT government’s motivations, on the other hand, are more difficult to work out. There will be income from land sales, but potentially substantial development costs. This is because the houses across the border will need to be serviced from the ACT, which means considerable extra public investment in infrastructure and service provision (specifically roads, pipes for water, sewerage and gas, and, eventually, schools, health services and public transport). The NSW houses will not be built for some time to come, but the size of the eventual development affects infrastructure planning now, as the ACT-side housing is built. While the Ginninderry website is very informative about how attractive the new suburbs will be, there is scant publicly available information on the joint venture arrangements between Riverview (the developers) and the LDA, or on negotiations regarding cross-border service agreements. This reticence should concern ACT residents and ratepayers as much as those of Yass Valley. The major concerns, however, are environmental and cultural. 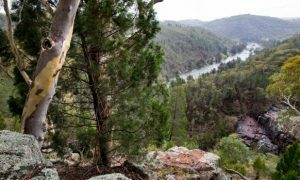 Not only is this part of the Murrumbidgee of major ecological significance, it also has particular resonance for the Ngunnawal people, who retain and remember their traditional links with this rich and diverse area. For Indigenous and non-Indigenous Australians, it is not just the falls that are important, but also the river corridor along Ginninderra Creek and the gorges of the adjoining Murrumbidgee. The setting, too, is significant, not least because there is so little recreational land of any significance to Canberra’s north. Riverview has promised a conservation corridor, but it is difficult for visitors to have a meaningful environmental experience when houses will eventually be built so close to the falls. With so much at stake, the precautionary principle suggests more caution in decision-making. While much scientific work has been done on the area, almost all of this has been commissioned by the developers, in accordance with the strategic assessments requirements of the Environment Protection and Biodiversity Conservation Act. As the Environmental Defender’s Office has observed, the conservation corridor is too narrow to reliably ensure the conservation of many species. Fire risk, especially from ember attack, has not been independently assessed. As is so often the case, the original zoning of the NSW land, which placed a much larger area under protective management, probably got it fairly right. Riverview has promised a conservation corridor, but it’s difficult for visitors to have a meaningful environmental experience when houses will be built so close to the falls. Some work has been done on Aboriginal heritage, although much more is needed. There are burial and other sites in the area, some unfortunately already encroached upon, others intact but not openly discussed by local Ngunnawal people for fear of further loss. It is at the landscape level, though, that the Aboriginal heritage of this area is most significant. Ginninderra Creek was an important route, for culture, trade and food-gathering. With a little imagination, it would be possible to bring to life, for Indigenous and non-Indigenous Australians, just how Aboriginal people used this area. But if these paddocks are allowed to grow only houses, there is little chance of this objective ever being realised. So, what is needed? In the short term, it is up to Yass Valley Council to show the vision that the ACT, despite its Labor-Green designation, has so unfortunately lacked. The existing environmental zone in NSW gives a good indication of the land required for sound conservation, and should not be rezoned. For its part, the ACT government needs to rethink its relationship with Ginninderry. It is not too late for the ACT to use its resources to come up with a new plan for Ginninderra Falls, one which, just for once, acknowledges the priority of the environment over development. If developers can set in train cross-border action, surely Yass Valley Council and the NSW and ACT governments can do something similar, in the public interest? Eventually, and with the full support of the stakeholders, there should be a conservation park encompassing this vital part of Australia. It may take years to get there, but at least if we do the right thing now, the possibility will not have been extinguished.